By keeping our customers in mind, we’ve developed very competitive guidelines and pricing and continue to build a strong, sustainable company for the future. 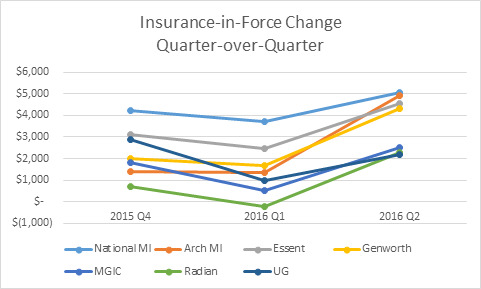 From our attractive Signature BPMI rates, to our industry-leading 12 month rescission relief and best coverage terms, National MI is leading the way in price, protection and performance. National MI is moving the market with our Signature BPMI monthly pricing by being the first to offer these great rates and delivering transparent consistent pricing that is sustainable over time, enabling TRID compliance for lenders. Our industry-leading 12 month rescission relief and coverage terms include a straightforward and clear master policy, Day 1 underwriting protection and appraisal protection, and Ironclad Reports that detail a lender’s loans that are covered, all for the peace of mind of lenders. Thanks to our customers, National MI is experiencing tremendous growth and our performance tells the story. We’re building a strong, sustainable company that aims to restore trust in the mortgage insurance industry while delivering competitive pricing and industry-leading products to lenders. In our third year as a public company, we achieved GAAP profitability in Q2 2016 with a net income of $2.0 million. As of June 30, 2016, we had primary insurance-in-force (IIF) of $23.6 billion. We have also enjoyed the largest primary IIF quarter-over-quarter growth in the industry for three consecutive quarters since Q4 2015, as illustrated in this graph below. Source: NMI Holdings, Inc. publicly available financial reports; competitor publicly available second quarter earnings releases.